Industry observers expected that the marijuana legalization trend in the U.S. would hurt liquor sales, but a new study from a trade association says that hasn’t been the case in the three states where weed has been legal the longest. “The trends in alcohol have been fairly consistent regardless of whether or not you have legalized recreational marijuana in a state or not,” says David Ozgo, chief economist for the Distilled Spirits Council. Overall industry trends remained consistent, according to the council, which did the study. 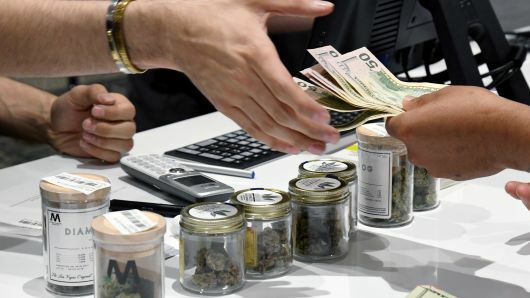 A customer pays for cannabis products at Essence Vegas Cannabis Dispensary in Las Vegas, Nevada. Industry observers expected that the marijuana legalization trend in the U.S. would hurt liquor sales, but a new study from a booze trade association says that hasn’t been the case in the three states where weed has been legal the longest. Overall industry trends remained consistent, according to the Distilled Spirits Council, which did the study. Spirits sales went up in the three states — Colorado, Oregon and Washington state — although wine and beer stayed on their mixed to negative course. “At this point, we’ve seen no impact on spirit sales from legalized recreational marijuana,” said Chris Swonger, the council’s CEO. The council analyzed per-capita alcohol sales in the three states for the two years prior to marijuana being legalized and up to four years after using state-level alcohol tax receipts and shipment data. Sales of spirits increased in all three states, from 3.6 percent in Oregon to 7.6 percent in Colorado. However, wine sales were mixed. They were up in Colorado and Oregon, but down in Washington state. Beer sales, which have been losing market share to spirits and wine over the last decade to begin with, were down in all three states. 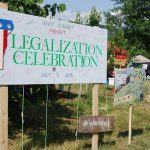 “The trends in alcohol have been fairly consistent regardless of whether or not you have legalized recreational marijuana in a state or not,” said David Ozgo, the council’s chief economist. The study found that overall sales of spirits, wine and beer were roughly flat. Colorado was up 1.7 percent, while Washington state and Oregon were both down 0.2 percent and 0.5 percent, respectively. 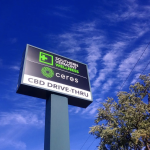 Cowen analyst Vivien Azer said low-end beer sales are most at risk as the greatest number of pot smokers continues to be lower-income white men. “Distilled spirits and wine are more insulated than beer,” Azer said, pointing to the growing popularity of cocktails and that women tend to prefer wine over beer. 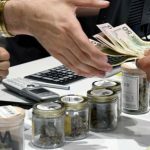 Still, analysts expect pot to take up a greater share of consumers’ disposable income as marijuana consumption takes new forms and gains social acceptance. Ten states and Washington, D.C., have legalized recreational marijuana. 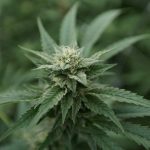 Several more are considering legalization in 2019.